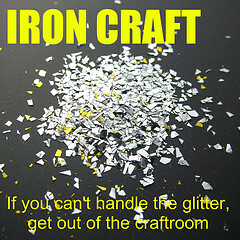 The final Iron Craft Challenge was announced a few weeks ago. I knew it would happen eventually, I was just hoping for another year though so that I could participate a little more. Unfortunately, much like my blogging, my crafting has taken the back seat to other things in my life lately. However, after doing so many of the Iron Craft Challenges, I couldn't let this last final one go uncompleted, especially given that it occurred over the holidays when I actually had a bit of time to craft! So, even though I was out of town, I headed to Joann Fabrics and picked up some supplies to work on the challenge. Originally I was going to do a bracelet to wear New Years Eve when I went out to dinner. I was thinking something similar to this only crocheted. 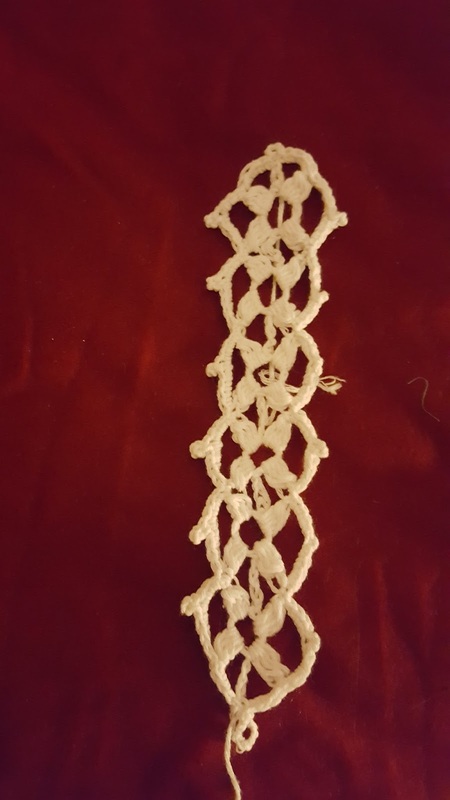 So I found this lace pattern and set to work. However, after I got it completed and blocked, I decided that I didn't really like it as a bracelet. I think it's actually better suited as a bookmark. So, there you have it. My final Iron Craft Challenge project. I'm sad to see the challenge end. I loved the idea of it and enjoyed seeing what everyone created. It surprised me that I reached a point where I could recognize someone's crafts just from the picture without seeing their name attached to it. So while I will miss the challenges, I understand that it's time for it to end and I thank the ladies at Just Crafty Enough for all their work.